A bright pop of color for todays photo! These are the foxgloves that are just outside my Moms front door. It has been raining HARD the past few days, but I managed to sneak outside between rain showers and capture some flowers in her garden, all covered in raindrops! Fabulous photograph of this pretty Foxglove. I remember these growing wild along many hedgerows when growing up in England. You know I dont think I have taken raidrops on a flower. Never thought of it. This is A fab pretty Foxglove in the wild. I dont think I have seen one in the wild where I live. Love the color. Not familiar with that lovely flower. Would love having one as well as some of your rain. Gorgeous! I love foxgloves! Yours look so intense with the rain! Lovely closeup! A pretty flower, love the raindrops! Beautiful foxgloves! Pink flowers are always beautiful, even if this guy does say so. :O) Have a great Saturday. 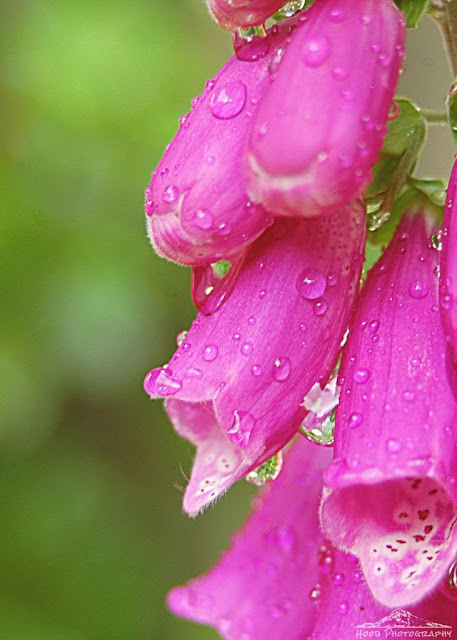 The raindrops on foxgloves image is perfect. Gorgeous flower. A late visit from WF. Hope you'd find time to visit my Lantana.